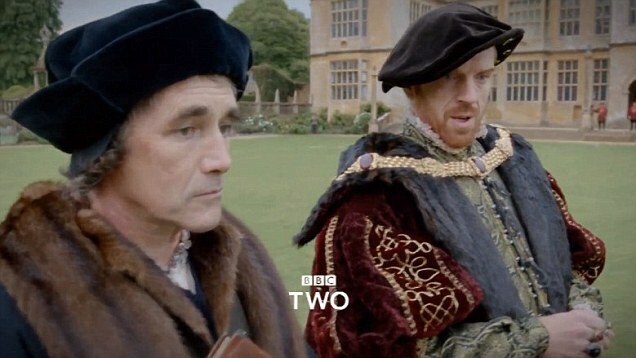 One of the great pleasures of the BBC series Wolf Hall, adapted from Hilary Mantel’s novels, has been to admire the costumes worn by the king and his court, from the scarlet robes of Cardinal Wolsey and the magnificence of the king to the fur collar worn by the otherwise sober Cromwell. Rich tapestries hang in the background and the ladies of the court are shown plying their needles. The Tudors loved to decorate every possible surface and even the grandest ladies were expected to be skilled needleworkers. 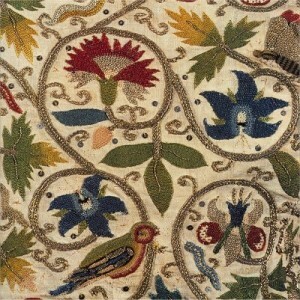 During the medieval period English embroidery was much in demand at home and abroad. An inventory taken at the Vatican in 1295 lists over 100 pieces of English embroidery, known as Opus Anglicanum. Royalty and the nobility also commissioned secular work, but the only examples that still exist are pieces of ecclesiastical embroidery from the 13th century onwards. There’s just time to see a unique exhibition of Ecclesiastical Embroidery in Ely Cathedral until Saturday 28 February. 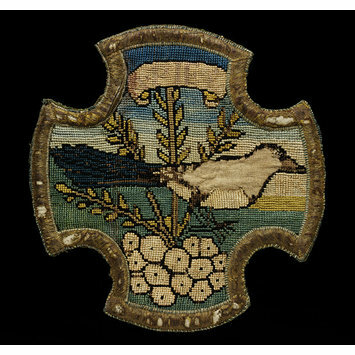 Over sixty items of needlework are on display, including items from the Cathedral’s own collections and some lent by the Royal School of Needlework from Hampton Court Palace. One of the objects on display is a medieval cope from Ely, an amazing survivor, and there are also a couple of events to accompany the exhibition this week. During the medieval period most of this work was produced by professional embroiderers in workshops. 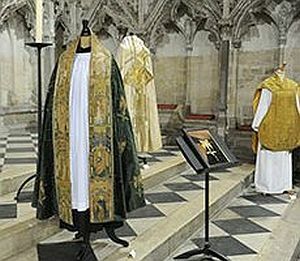 Vestments, like the cope illustrated, were gloriously decorated, often with biblical scenes or saints. They included gold and silver thread, and even precious stones, and standards of workmanship were high. After the Reformation existing embroidered garments were often plundered for their gold and silver and demand for ecclesiastical robes plummeted. During Elizabeth’s reign there were major disagreements about whether priests should wear vestments at all. Professional workshops adapted to the fashion for more secular designs, and woodcuts in books such as herbals and bestiaries were used as patterns. At the same time, it became much more common for wealthy women to create embroideries, decorating their homes and clothes. A huge variety of items were embroidered, including night-caps, gloves and shoes as well as the more obvious items of clothing. In portraits the sitters can be seen wearing bodices, caps, sleeves and even smocks, beautifully embroidered at the neck and cuffs. Embroideries also added beauty and comfort to domestic items, and decorated sheets, boxes, and books complemented sumptuous textiles such as table-carpets and tapestries. In Shakespeare’s play Othello the Moor gives Desdemona a handkerchief embroidered with strawberries. When he finds it, Cassio asks another woman, Bianca to “take me this work out”, or copy it. Othello attributes the handkerchief with supernatural powers: “there’s magic in the web of it”, and Desdemona’s fate is almost sealed by the loss of this little object. Considering their vulnerability, it is surprising how many embroidered objects of the time survive. The Victoria and Albert Museum in London has an amazing collection, and there is an excellent guide to the history of embroidery on their website. They hold many panels embroidered by Mary Queen of Scots during her captivity. The one illustrated is on linen, embroidered in silk, silver and silver-gilt. In 2014 The Ashmolean Museum in Oxford was given the Feller collection of seventeenth-century English embroideries, complementing those already held by the museum. The Eye of the Needle, the exhibition celebrating the gift, ended in October 2014 but the English Embroideries Trail to some of their treasures on display is still being publicised. This website includes some glorious portraits, including close-ups of embroidered details, and this page is devoted to sixteenth and seventeenth-century coifs (close-fittings coverings for the head). This site includes a history of needlework and technical information. Both on one sampler, sitting on one cushion. As well as being valued for their beauty, perhaps embroideries were prized by the women of the family who made them as heirlooms symbolising precious female friendships. This entry was posted in Legacy, Shakespeare's World and tagged Ashmolean Museum, BBC, Ely, embroidery, Hilary Mantel, Mark Rylance, Mary Queen of Scots, needlework, sewing, Victoria and Albert Museum, Wolf Hall. Bookmark the permalink. Sylvia, the Ashmolean have transferred their Feller collection exhibition to their small but brilliant museum at Broadway, Gloucestershire. It’s called “Stitches in Time” and is on from 14 February to 7 June. St Peter’s Church at Winchcombe has an altar cloth permanently on display which is thought to have been embroidered by Henry VIII’s first queen, Catherine of Aragon. It has pomegranates, her emblem, on it. Thank you so much for this information. I didn’t spot it on the Ashmolean website, strangely enough. Thanks too for the info about Winchcombe. I didn’t know this either! Whoops! I mistakenly placed Broadway in Gloucestershire when it’s actually in Worcestershire!